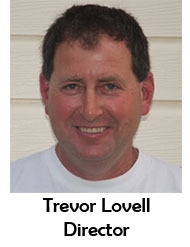 Lovell's is a wholly locally owned and operated business, servicing Portland & District. From humble beginnings Lovell's have grown to become one of Western Victoria's largest independent suppliers of concrete & building materials. To provide the best possible product. With the best possible service. So that you, the custome are satisfied. With over twenty years experiance in the concrete & construction industry, Lovell's are the team to consult with about your project, no matter what size it is. No job is to small, and we haven't found one yet that has been too big. From a Garden Path to high strength, high density concrete for a major project contact lovell's for the answers. At Lovell's we have aligned ourselves with the leading brands in Building & Architectual supplies, Garden Materials, Fencing, Brick, Block & all forms of masonry. Brands like Blue Circle, Rinker, Austral, Sims, Unitex, Fielders and Sferco to name just a few. All world leaders in their fields with a wealth of knowledge and expertise at our disposal to assist you with your project. With a full range of professional industry consultants on tap available to advise and consult with on your requirements.